All I really need to know I learned in Kindergarten. You’ve heard that saying a million times. Things like ’be kind to others, wait your turn, and don’t be wasteful’ come to mind. Whether you are 5 or 55 years old, these Kindergarten lessons hold true today even when doing something as simple as packing your lunch. Garbage follows us everywhere we go. We generate waste at home, work, and school. In fact, each Minnesotan generates 6 lbs. of trash per day. According to the Minnesota Pollution Control Agency’s September 2010 study Digging Deep Through School Trash, Minnesota K-12 public schools generate an estimated half a million pounds of trash each day. And even with our best efforts to recycle and compost, the amount of garbage keeps increasing every year. The best way to change this pattern is to stop creating trash in the first place. 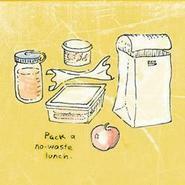 One easy way to do this is to pack a no waste lunch for yourself and your kids. A no waste lunch is simply a lunch that produces no trash! Plan ahead. Prepare a grocery list and shop for the week so you are well stocked with your lunch necessities. Last minute lunches are often wasteful and expensive. Involve your kids. By having kids plan and pack (or help pack) their lunch and choose foods they like, they will likely eat more and throw away less. Buy food items in bulk. Buy larger quantities of items with a long shelf-life or items you replace on a regular basis (i.e. nuts, trail mixes, peanut butter, dried fruit, chips, pretzels, crackers, etc.). This reduces waste and is often less expensive. Visit the MPCAs Buying Food guide for additional tips and resources. Use a safe and environmentally friendly lunch box. Metal lunch box. These old-school metal lunch boxes are making a comeback. They're durable, easy to clean, and travel well in backpacks. Bento lunch box. Bento is the Japanese art form of making a packaged lunch. Traditionally in Japan a bento consists of rice, fish, and seaweed. American-style bento lunch boxes are designed to help you pack nutritious, waste-free lunches. Organic cloth, cotton or recycled plastic lunch bags. Look for reusable bags that are made from organic cloth or recycled materials. Fill your lunch box with reusable containers. Packaging makes up 30% of trash in Minnesota. Cut this waste by putting your sandwich or leftover hot dish in reusable containers. Plastic containers work well for fruits, vegetables and snacks that don’t need to be heated. Glass and ceramic are a great option for re-heating last night’s leftovers. TIP: Tired of your kids losing or throwing away containers? Put personalized stickers with your child’s first name on the containers or offer a nickel each time they bring them back for a ‘refill’. Choose a reusable water bottle. Carry your own water bottle and choose one without bisphenol A (BPA). Many manufacturers offer bisphenol-A free bottles. Don’t forget the cloth napkin and reusable silverware. Add a touch of class to your lunch! After use, wash it and use it again, and again. Website: Waste-free Lunches. Reduce, Reuse, Recycle, Rot. In addition to preventing waste by packing a no-waste lunch, parents and teachers can encourage their school to start or expand the recycling program. It's worth it. Twenty eight percent of school waste can be recycled. Add a composting program to your recycling program and more than 75% of school waste could be diverted from the trash! The Recycle More Minnesota Toolkit for Schools helps parents, students, or employees get a recycling program organized and operating successfully.The toolkit contains videos, case studies, worksheets and other resources. Community members are invited to the National Public Lands Day Celebration. September 24, 8:30am - 2:00pm, Indian Mounds Park (St. Paul). Moving Planet: A Day to Move Beyond Fossil Fuels is an international day of action on climate change featuring a festival where dozens of organizations will share resources and activities to help you live a more sustainable life. September 24, 2:00pm, State Capitol lawn (St. Paul). 2011 Minnesota Solar Tour is a the self-guided, public tour featuring over 50 exemplary homes, businesses, and institutions that have incorporated renewable energy into the design and operation of their buildings. October 1, 10:00 a.m. - 5:00 p.m. (Statewide). Learn about a variety of renewable energy projects that convert biomass to power, ammonia, fuels and other chemicals in this workshop The Next Frontier: Grass to Gas. October 19, 7:30 pm, White Bear Unitarian Universalist Church (Mahtomedi).